To facilitate support for those affected directly or indirectly by genetic conditions throughout Australasia. 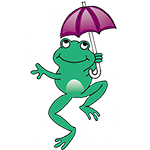 Click on Bert, the Genetic Alliance Frog - to make a donation. All donations over $2 are tax deductible.